Have you heard of lucid dreaming? This is when a dreamer is fully cognizant of being in a dream state. Some authors actually work at learning to control this form of dreaming as a means for shaping their projects, regardless of whether they are focused on fiction or non-fiction. Dreamscaping or dream sculpting (as the process is sometimes called) allows the dreamer to actively contemplate the contents of a dream while asleep—and to question how these subjects may be relevant to their personal or professional living. Wordsmiths and artists are often encouraged to keep notebooks at hand for recording stray thoughts that can help them maximize future creativity. This includes placing a pen and paper by your bed for capturing ideas that may materialize during the night. For those of us relying on random ideas on which to build our shaping of words and images, it can be important to retain unexpected thoughts. I can report that I have benefitted from vigorously striving to record the contents of potentially significant dreams. And I’ve suffered the disappointment of having forgotten to have the implements for recording anything before falling back into a deep and dreamless state. The mornings that have followed have been very frustrating. Far worse than a simple hangover experienced by authors of yore! A simple Internet search will yield instructional resources for learning to implement Lucid Dreaming. As I’m not a specialist in this field of study, I’ll merely share how I have approached the topic. After reading some background material, and discussing the concept with artists, I decided to delve into the process several years ago. I began my sojourn in this endeavor by placing a retractable pen and small bound book for journaling on my bedside table. Do note that having a pen without a lid has proven invaluable to my night-time note writing, since I’m rather clumsy and a bit befuddled when rising from a vivid dream. Most evenings, I spend a few minutes before going to bed contemplating projects I wish to undertake the following day. Often, this is while rocking in a chair and petting my cat, which I find soothing on several levels. I then read a few pages of both meditative and mystery books. After turning off my reading light, I review my to-do list. I won’t claim that my contemplation of work goals is directly responsible for yielding inspirational ideas during the night. However, these practices do serve as an off-switch for my overactive mind. As anyone attempting to call me in the a.m. will attest, I am not a morning person. Some of my best work is born in the silence of nocturnal hours. So prior to entering my pre-sleep routine, I’m already in a creative thinking mode. The number of hours I spend in sleep varies, but when most people are rising to their own days of productivity, often I am entering my deepest dreams. While most may seem unrelated to the work I envision undertaking, they are varied in topic and have a film-like quality. Having disciplined myself to interrupt the dreaming process, I can now report overall success in benefiting from dreaming with lucidity. Records of some of my dreams make it into my journal. Elements of others capture my attention sufficiently to be recalled for several hours after my waking. Perhaps the worst challenge that arises from the overall experience, is being forced to fold new concepts into work I may have considered complete. Sometimes that means reprinting quite a number of pages of text due to a minor edit in their midst. However, I’m thrilled to report that expanding a character’s role by having her play a bamboo flute has yielded a lovely audio element to that scene… and an interesting twist to the epilogue for Yen for Murder, Book Four in the Natalie Seachrist Hawaiian mystery series! You’ve successfully conducted an interview! Regardless of whether an interview is the first or the hundredth, I hope you will feel a sense of accomplishment while parting company with whomever you’ve interviewed! By this point, you should have an audio (if not visual) recording of the dialogue, plus notes you’ve composed prior to and during your conversation. You should also have a signed interviewee release that can allow you to draw from the experience indefinitely. In my last discussion of general and oral history interviews, I noted that it is good to impress your subject positively. Doing so includes: projecting a pleasing appearance and voice; demonstrating the level of your commitment, as shown by your research and organization of pertinent questions; and, your sensitivity to their physical, mental, and emotional circumstances. That last issue is one that is often neglected by professional, as well as novice, interviewers. Too often a sense of righteousness on the part of the interviewer as truth teller can prevent development of a significant rapport with the interviewee. While it is important to maintain a professional relationship, the lack of a rapport with your subject may lead to a diminished level of trust and desire to reveal themselves fully. As you prepare to depart from an interview, you will want to leave the door between you and your subject open to further communication. After all, they’ve trusted you with a part of themselves and they want to know that you’ll value what they have shared with you. Even if you have not established a warm relationship, you will want to facilitate future communication and assure them that they will have an opportunity to view a transcript of the interview. This does not mean you are relinquishing your role as the interviewer, nor does it imply you are going to change revealing the realities of your conversation. However, if errors are found by either of you, there should be a means for adding explanatory notes. This is especially useful in clarifying names, relationships, numbers, dates, and sequences, which may have been transposed or mistakenly described. During the transcription and editorial process, you may need to communicate with your interviewee to gain clarity on numerous points. To maintain accurate records, it is good to receive replies to your questions by email or other written documentation. This is especially useful if there are conflicts regarding the meaning of a passage. After all, the interviewee is relaying answers to your questions through the lens of their point of view. While you may never agree with their explanation, the transcript and your notes will allow future readers and/or listeners to experience a close approximation of the event and draw their own conclusions. This is why clear records of all your communication and notes are so important. The method[s] of annotation you choose for your transcript can take several forms. This is where your creativity comes into play. Personally, I try to avoid footnotes. Instead, I employ bracketed statements for minor clarification and section endnotes for issues dealing with proper nouns and other facts that may stimulate a future reader to pursue answers to their own questions. Although the interviewer should not remove actual dialogue, you can provide clarification of key points by including a glossary of foreign and specialized vocabulary, as well as an index. Some authors dislike the use of indices if they plan to publish via a downloadable vehicle that may render pagination inaccurate and irrelevant. However, readers of a work published on the Internet may be able to utilize a find/search tool to locate terms they wish to revisit and readers of a hardcopy edition will be pleased with the inclusion of an easy reference tool at the back of the work. Another means for heightening the usefulness of your final product is separating your transcript into sections. If the interview was conducted during multiple sessions, utilization of chapter breaks is quite logical. Even when the conversation was held on a single occasion, separating sequenced questions and answers provides natural breaks. The potential for scheduling future interviews may depend on issues beyond a mutual desire to do so. For example, if the interview is part of a larger project controlled by someone else, you may be limited in continuing your relationship with your subject. 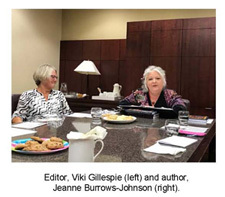 And, although the current publisher may express an interest in further interviews, shifts within their organization may preclude future publishing through them. Even when you are working on a wholly freelance basis, your ability to publish may depend on your finding a new source willing to take on the project. And if you decide to expand the initial work into a series of articles or even a book, the task may become even more challenging. As I’ve noted before, planning, executing, and publishing an interview is a unique experience. Even without the permanency of the Cloud, an interview lives far beyond the event itself! The effort you put into researching your subject’s life and work may prove of interest to people far beyond your targeted readership. The dialectical elements of the conversation, introductory remarks, annotations, and other explanations will serve not only to illuminate your subject, but also your own life’s work. 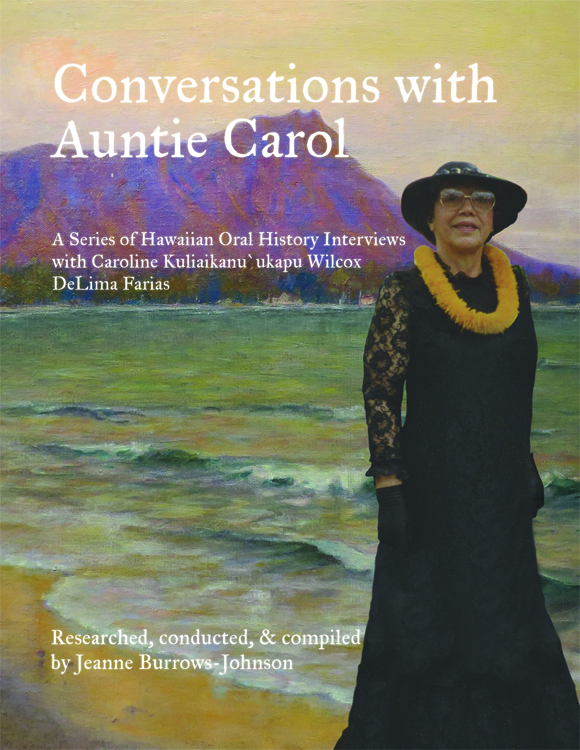 In my next blog about interviews, I will discuss the renewal and publication of oral history interviews I conducted more than 25 years ago with a dear Hawaiian auntie whose family history is very interesting…The title is, Conversations with Caroline Kuliaikanu`ukapu Wilcox DeLima Farias. Here are my offerings on interviews and oral histories. Few people willingly give up control of their personhood to allow a stranger to delve into their inner thoughts. But those private thoughts are what an effective writer must access to produce a true facsimile of each interview they conduct. For as a professional or even an amateur writer, your goal is to meet your listeners or readers expectations that they are sharing your sensory experience while gleaning the particulars of why the highlighted individual is worthy of their attention. In several blogs, I’ve stressed the importance of preparation to conduct both general and oral history interviews. In contrast, there are some writers who feel that research and other preparation is unnecessary, or even unwarranted. I strongly disagree. I believe research is vital to empowering your words in the interview process. It will also help with establishing your credibility as a wordsmith who has mastered the art and science of writing. In short, it’s one of the best ways of demonstrating your skill at the art of communication and making your subject trust you. The bulk of your questions will be determined by the purpose of your project. In some cases you’ll need to conduct interviews with multiple persons. By asking parallel questions of each, you can compare and contrast their views of the primary subject, as well as one another. Regardless of whether there’s any obvious controversy you must address, beginning your interview with general questions about the unfolding of the subject’s life, can assist in putting them at ease…if their mental processes are fully functioning and there are no hidden elements in their early life. By delivering the early portion of your questions chronologically, your interviewee can mentally relive moments with which they should be comfortable. Additionally, taking them through the recognizable patterns of the decades of their life may trigger remembrance of small details. This will not only enhance the interview itself, but also add color to your subsequent reporting of the event. This can, of course, lead to some sidetracking, but you should be able to steer the conversation back to the key points you need to cover. Prior to, or during the interview, you may uncover facts about your subject’s life and work that are at odds with information the person has released in the past. In this case, you’ll have to decide whether to directly question these inconsistencies. Of course, you’ll want to keep in mind that true or false, the opinions of others may have colored the public record. Also, the perspectives of most people change with time and life experience. And, whether we like to admit it or not, everyone has gaps in their memory, without necessarily being conscious of it. It’s nearly show time. That’s right. I said show time. While serious scholars and journalists may dislike hearing me say it, an interview is usually a semi-public performance. Unlike a play, the dialogue is not set in stone; unlike an evening at an improv theatre, it’s not without direction and form—for that’s your job. But like a play on Broadway, it will be frozen in time, even if you conduct subsequent interviews. It’s been my experience that interviewees often set and control the location of the interviews they grant. This may not be the case for broadcast media and bloggers with sets in which the subject is expected to appear, but you are probably not working in these situations. Admittedly, it’s best to conduct an interview at a site to which you’re both agreeable, but sometimes you must accept interviewing your subject in their office, home or other location of their choice. Nevertheless, there are things you can do to balance the situation so that you’re able to subtly declare your professional standing, while still putting the person at ease. There are many authoring strategies that can help to distinguish your work as an interviewer. Establishing a good rapport can be the key to making the interviewee trust you with the information they’re imparting. To do this, you might bring something with you to enhance the experience. This could be an edible item, or, if you know they are fond of a particular author, you might obtain a copy of that writer’s work to share with your subject. Please note that I’m not suggesting you spend a significant sum of money to buy your subject’s cooperation. But small acts of kindness can help warm the atmosphere, demonstrate the thoroughness of your preparation, and make the entire experience positively memorable for both of you. Anxiety will undoubtedly arise, regardless of your preparation. Despite previous contact you may have had with a subject, being in their presence (even by video conferencing or telephone) changes the balance of your relationship. There is another factor that may detract from your rapport with your interviewee: If there’s an aspect of their lives that makes them suspect in the eyes of the public, they may be hesitant about granting you an interview. They may be apprehensive about information you may have uncovered already…or what they might reveal in conversation with you. Even when you have secured the location for holding the event, you cannot be certain of being able to completely control the environment. As you set up your equipment, be aware that recognition of the permanency of the record of their interview may be upsetting to your subject. Even if you have provided them with a copy of your primary questions, they may dislike seeing the list set out before them. They may also have negative feelings about seeing any reference notes you’ve brought. But since such materials should be in easily read styles and sizes of fonts, you’ll be able to quickly reference pertinent facts, while maintaining eye contact and keeping the dialogue between you as natural as possible. Establishing and maintaining a smooth flow of conversation is a primary goal in the interviewing process. Regardless of whether your personal views are in accord with those of your interviewee, it’s important to approach what they have to say with a calm, if not fully open mind. This does not mean that you have to forfeit your role as the honest broker of truth. However, you can adjust your personal style of behavior and other elements to maximize a positive atmosphere. After all, as in any natural conversation, your subject will periodically lead the discussion. That’s fine as long as they do not deviate greatly from the purpose of your dialogue, or delve into personal details of your life. After opening pleasantries, you can help direct the flow of the interview by verifying the amount of time you’ll have with your subject. This establishes a guideline for both parties and should make your periodic redirection of topic easier to explain. Although you’re guiding the overall direction of the conversation, information will arise that may surprise you, or at least call for cursory examination. This may occur because the man or woman to whom you are speaking may have talking points of their own that they wish addressed. If that’s so, let them express their concerns, and then try to deftly redirect them to the specific information you need in order to complete your project. Sometimes an author feels stressed about the relationship between the creative process and editing. As you review an interview, you will not only want to envision how you will shape an accurate account of the event that reflects truly inspired writing as well. One thing that can help you achieve this dual pronged goal is to remember that the way in which you report your findings may be wholly different than the substance and sequence of the questions you posed. For example, if you’re part of an oral history project, there may be a specific format for you to follow. This generates a record that harmonizes with the results of other interviewers within the larger body of work. Typically you’ll prepare a transcript of the actual dialogue between you and the subject—often with punctuation or other markings to indicate accents, pauses, stresses, and other notable features of your conversation. You may also write an introductory passage explaining your methods of preparation and your evaluation of the results you’ve achieved. If you’re working on assignment for a media outlet, you might have the opportunity to write a personable article containing both dialogue and narrative prose. In this case, you may be allowed to offer your candid view of the person you’ve studied. Be aware, if you’re working as a freelance researcher and writer, you may need to prepare multiple versions of your report in order to secure one or more appropriate outlets for its broadcast or publication. I should note that there are situations when an interview will be available to only a select audience, or may be held in private for release at a future time. As you finalize your work on an interview, you’ll want to remember that in this day of permanency in data recording and retrieval, the words you shape after the interview will live as long as the event itself. 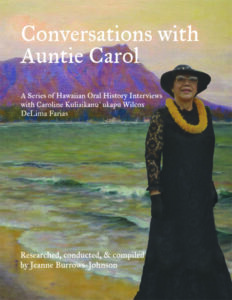 To learn more about the Conversations with Auntie Carol, a few Island recipes, the Natalie Seachrist Hawaiian Mysteries and other projects, please visit my author’s website at JeanneBurrows-Johnson.com. For more ideas to strengthen your Wordpower© and branding, please visit my marketing website, Imaginings Wordpower and Design Consultation.